Watch Abraham cook Turkey Fav for the family, using Mariam’s Miracle Seasoning. 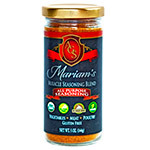 What’s the ‘miracle’ in Mariam’s Miracle Sauce and Mariam’s Miracle Seasoning Blend? Mariam developed these products to meet her family’s needs (or her son’s specific dietary needs). Now, your family can enjoy the benefit of truly healthy meals that offer exceptional taste and ease. Our gluten-free products use only organic, preservative-free ingredients that are rich in flavors and add a unique taste treat to a variety of dishes—soups, vegetables, and main dishes. You’ll be delighted with how quickly you can prepare delicious sugar-free food that is low in sodium. As a socially conscious company with an interest in the special-needs community, AGS, Inc. will give a portion of its profits to organizations that support these gifted individuals. I developed my products to serve the dietary needs of my son. I founded Aurora Gourmet Spices (AGS) for ALL to enjoy. No matter if you are gluten-intolerant or gluten-sensitive; or if you and your family just prefer healthy, organic, preservative-free foods, I believe you should take pleasure in every bite. It was my joy to create AGS for my son . . . it gives me even greater delight to share “the miracle” of healthy eating with you. 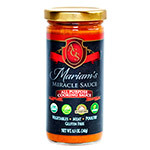 So from my kitchen to yours, please enjoy Mariam’s Miracle Sauce and Mariam’s Miracle Seasoning Blend.